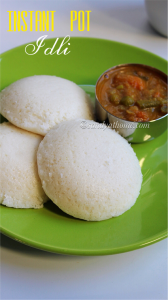 Idli is a steamed rice cake, one of the traditional breakfast made in South India. It is prepared using homemade / store bought idli batter made with rice and urad dal. 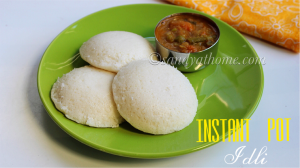 Idli in instant pot is just a new way of making idli in electric pressure cooker. 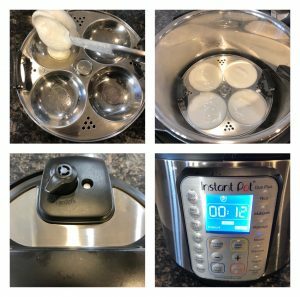 All we will get to know in this recipe is how to use the instant pot options to make soft and fluffy idli just like our traditional idli steamer does. Actually to be honest the IP took the same time to steam the idli just like regular idli steamer and I had to babysit the IP and kept a watch on clock as there was no time display in IP steam mode when valve was kept in venting position. But I should say that it did a great job by giving same quality idli as made by idli steamer a neat one. Definitely one of the trusted product to make idli when your idli steamer is busy. But again there will be no time saving. So lets get to the making! 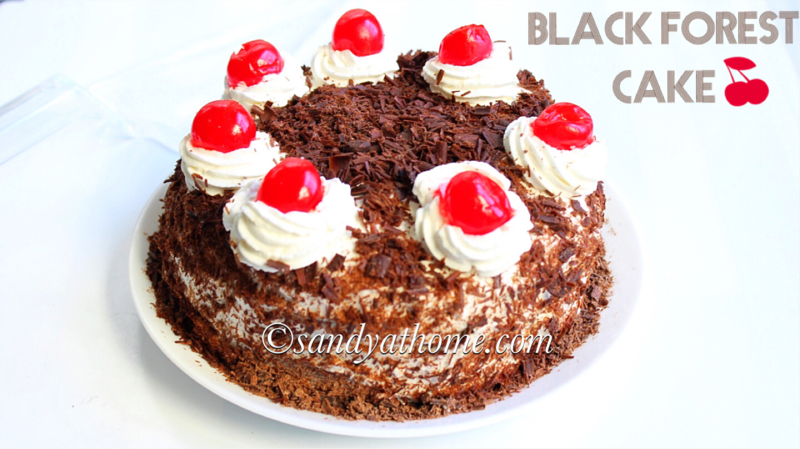 If you are looking for batter recipe click on the below link! In the instant pot add 2 cups of water. Then place the wire rack. Switch on SAUTE MODE to boil the water. Meanwhile grease idli plates with few drops of oil. 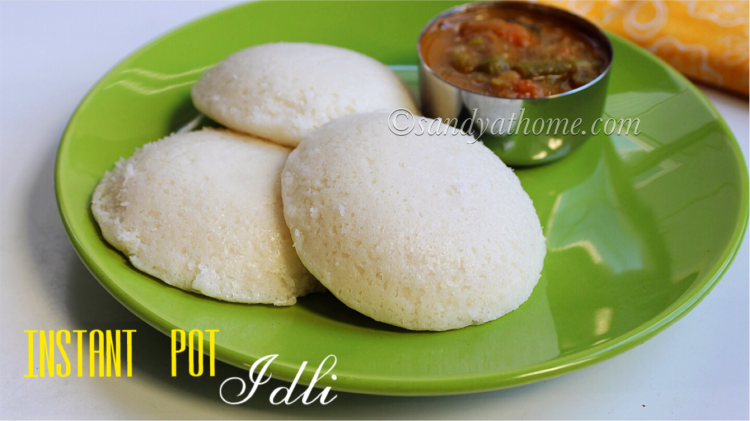 Pour ladle of batter in each idli mold and place the batter filled idli plates in the instant pot vessel. Now switch off SAUTE MODE. Close the instant pot with lid and keep the valve in venting mode and switch on steam mode and set for 12 minutes. There is no time display in steam mode in venting position so keep an eye on the clock. Steam the idlies. After 12 minutes when the idlies look done done remove the idli plate from the IP and keep it aside for 2 minutes. After 2 minutes wet a spoon with little water (wetting the spoon with water helps in and scoop idli from the idli plate and serve it hot with chutney of your choice! In the instant pot add 2 cups of water. (I used instant pot cup for measuring water it was 160 ml) Then place the wire rack. Switch on SAUTE MODE to boil the water. Meanwhile grease idli plates with few drops of oil. 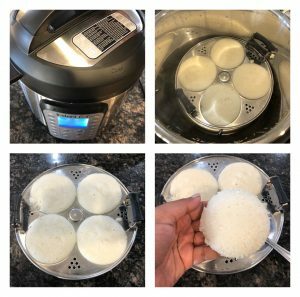 Pour ladle of batter in each idli mold and place the batter filled idli plates in the instant pot vessel. Now switch off SAUTE MODE. 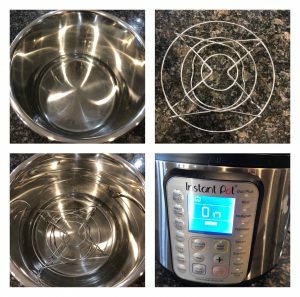 Close the instant pot with lid and keep the valve in venting mode and switch on steam mode and set for 12 minutes. There is no time display in steam mode in venting position so keep an eye on the clock. Steam the idlies. After 12 minutes when the idlies look done done remove the idli plate from the IP and keep it aside for 2 minutes. After 2 minutes wet a spoon with little water (wetting the spoon with water helps in and scoop idli from the idli plate and serve it hot with chutney of your choice!